I believe Obama is holding the gun of civil riots to the head of Mr.Trump. With a simple order from social agitator and Billionaire George Soros, the riots could turn destructively brutal. The scenario could easily digress, giving Obama a reason to suspend Trump's inauguration due to a national security crisis. This hand-off of power between two administrations is always a deal with the devil, and the devil has a lot of vested interest in the corruptocracy of the U.S. government. Literally Trillions of dollars and all of our freedoms hang in the balance. The eyes of the world are on Trump, and his Administration picks will speak volumes to us all. The purchase of this DVD is what funds Wake the Church! Bush successfully pushed Obama into covering-up the murderous sins of his administration, and now Obama is trying to do the same thing with Trump. Obama knows as an independent Trump will be much harder to persuade into continuing the legacy of war and executive overreach. So think back during the Hillary campaign, when Obama said it would be a 'personal insult' to his legacy if Hillary didn't win, what he meant is, his legacy of perpetual war, Constitutional usurpation and moral degradation. Well Hillary failed to deliver, and now it is quite obvious that Trump is being pressured by the Obama administration to cooperate with them, or in Chicago mob-boss fashion, bad things will happen. You can bet the neocons that are descending on the Trump campaign like vultures of war have something to do with all of this too, seeing they are the hidden-hand that handles every president since the Ford administration. They are also the ones that use crisis politics to manage the war-state. The neocons are the masters of this tactic, Obama and the Alinskites in his administration are toddlers compared to these guys. How can we know that this is happening? Well because of the obvious change of tone immediately after his Whitehouse visit this last week. He went from saying Hillary should be in Jail on the debate stage, to saying "I don't want to hurt her" on 60 Minutes. "On December 19, the Electors of the Electoral College will cast their ballots. If they all vote the way their states voted, Donald Trump will win. However, they can vote for Hillary Clinton if they choose. Even in states where that is not allowed, their vote would still be counted, they would simply pay a small fine – which we can be sure Clinton supporters will be glad to pay! Retreat, comprise, and mercy in this instance will, and I mean WILL come back to haunt you Mr. Trump in ways that are simply unimaginable to you right now in this transition period. All they are waiting for is your cooperation to take Obama up on his personal mentorship offer, like he said just yesterday, his team is 'ready to assist.' Just take their offer and the media will instantly be your friend and the protestors will be called off, whisked away like fog in the afternoon. Simply diabolically two-faced, and sinister. 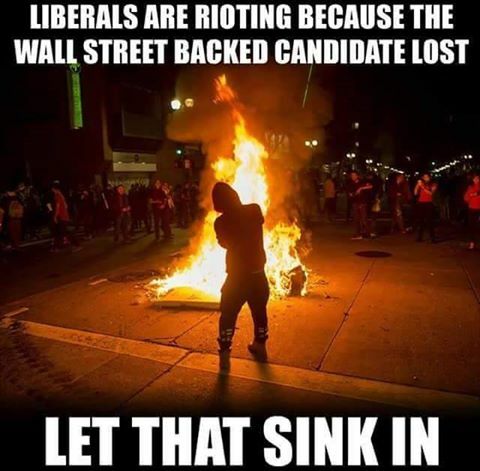 So when we think of the radicalized protesters in the streets we just have to remember, they are only mimicking, the divisiveness, violence, and chicanery they see out of their establishment leadership like Hillary. The protestors are in a drunken rage just like Hillary was reported as being right after the election results were announced. When asked about rumors that Hillary was drunk on election night, Kincannon responded, “She was. I posted about that too. She was in a “psychotic drunken rage” according to my reporter friend. Doctor added sedatives to the mix. The protestors are an extension of Obama and Hillary's worldview. A worldview that says there is no-God, therefore there is no right or wrong, and therefore they can do what they want because only the strong survive. That is exactly what is on the table, the survival of America and its Constitutional values. Trump you must prove yourself stronger than the radical communists entrenched in government. The fact that the leftist protestors have radicalized themselves on behalf of Hillary and Obama is really sad, they had Bernie, Hillary killed the Bernie revolution, and now they are revolting on behalf of the murderess herself. Even if Trump is an egotist and chauvinist which I don't believe he is, at least the RNC didn't tank the populist Trump like the DNC did Bernie. It sounds to me like y'all have some internal problems that should be the focus of the protestors rage. Trump crushed Clinton, she was, and never will be likeable, and that is the DNC and liberals fault for allowing her candidacy to continue into the general election against someone like Trump. These riots are a nationwide National Security issue thanks to the vileness of the Clinton Campaign and its radicalized, bigoted, race baiting rhetoric. This is how presidents are managed through the clandestine creation of security threats, and this is exactly how "THEY," the Shadow Government plans to control Trump from start to finish. The hand-off of power would have been easy breezy had Clinton won, but with Trump, straight up mafia type extortion will have to do. Please 'LIKE' us on Facebook here, and also sign up for the Wake the Church Newsletter. Rand Paul knows what is at stake with these appointments, partner yourself with people who have a proven track record of successfully standing up for Liberty and against the neocon puppet masters. "I couldn't vote for Bolton unless he repudiated his support for the Iraq War and repudiated his support for regime change throughout the Middle East, repudiated his call for immediately bombing Iran," Paul told CNN's Wolf Blitzer. We must be in prayer, the radicalization of the left starts at the top and extends to the protestors. Conservatives have seen this radicalization within our country and responded by buying over 100 million guns knowing full well what is at stake here, and where this all leads. We need Trump to go after these guys in a McCarthy type zeal. McCarthy's quotes about the communist takeover of America are so very relevant today. The communists are the international, moneyed power behind the institutional take over of America, including its government and including our educational institutions. The publicly educated kids literally hate America and its values as a result, this needs to be combated at the educational level as well as the political. The country will not survive without a coordinated exposure and attack on these traitors. The eyes of the world are on you President Elect, trust God, and trust your supporters to get you through this battle, without question God put you there for a time such as this.